GetUp! is a grassroots political organisation which claims not to support any particular political party. They’re going to be handing these cards out at polling places on Saturday. Just in response to your election scorecard: I’m in support of a”spin-free” scorecard, but from a purely marketing standpoint, I can imagine swinging voters such as myself might be unconvinced of its impartiality given the lovely “full marks” you’ve given the Greens. It reminds me of the kind of “unbiased comparisons” you see in paid-for car advertising, etc. 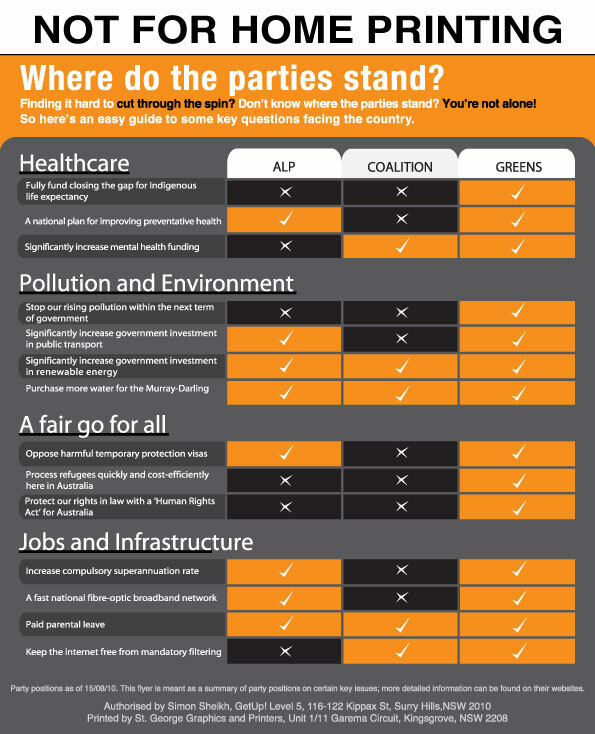 I know this is intended as a small, quick-glance tool, but if you’d like to consider yourselves (ourselves) impartial, and you hope to get the interest of intelligent people who might not already be GetUp members, it’d be best to avoid looking like a front for the Greens, however much you (we) might support their ideals. Love your work generally. Keep it up. Am I being picky or just naive?